1. Break the white chocolate into chunks and place in a microwaveable bowl. Microwave the chocolate in 30 second bursts, making sure to stir well between each to avoid burning. When the chocolate is smooth with no lumps remaining, spoon 4 tablespoons into a piping bag and set aside for decoration. 2. Break the digestive biscuits into a large bowl and mix in 60g pistachios, 100g cranberries, the marshmallows and the coconut. Pour the remaining white chocolate over the top and mix gently until all of the dry mix is completely coated. 3. Line a 22cm square brownie tin with cling film and press the rocky road mixture into the tin, making sure to get it right into the corners. 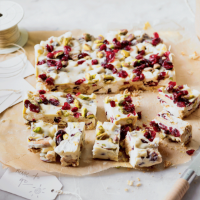 With the piping bag, drizzle the reserved white chocolate over the top, then sprinkle over the remaining pistachios and cranberries. 4. Refrigerate for at least 2 hours before slicing with a sharp knife into approximately 24 even squares. This rocky road will keep for up to 2 weeks in an airtight container.